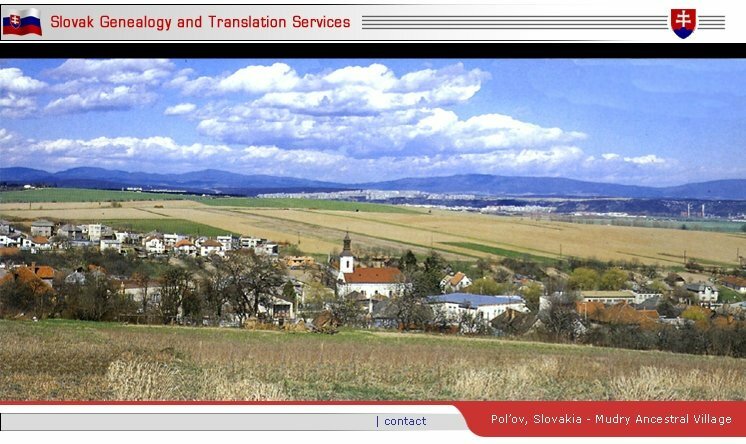 Slovak Genealogy and Translation Services welcomes you to it's website. If you are interested in your family tree, family history, ancestral past, having documents and letters translated or help to locate relatives and family members still living in the Slovak Republic,, you have come to the right place. We provide Genealogy Research to trace your family history and upon completion we will send you a completed Ancestral Report containing your Personal Ancestral Chart, Family Group Sheets and Pedigree Charts listing all names and pertinent information on your Ancestors. In addition when available, copies of church records containing baptismal, marriage and death information will also be included in your report. Research is conducted in those former areas of the Austria - Hungarian Empire and the former Czechoslovkia which are now present day Slovakia. I would also be prepared to do research in other countries of Eastern Europe where information is available. We also provide a translation service to translate documents and letters in to English, If you are trying to find distant relatives and family members still living in Slovakia we will use our resources to help find them and put you in touch with them. Send along your comments and I will add them to our " What our Clients Say " Section.